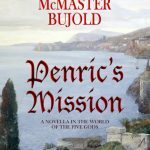 At the beginning, Penric finds himself on a ship approaching Cedonia on a secret mission for his new benefactor the Duke of Adria. But of course things are not what they seem and go wrong from the moment Penric sets foot on land. Penric and Desdemona have to employ quick thinking and quite a bit of magical and other ingenuity to deal with dungeons and falling in love. They have to try to heal the impossible-to-heal – uphill magic all the way – and escape in a daring coach chase across half a country. Several near death experiences and a horse named „Pighead“ complete the obstacles they encounter along their way. And those whom they are ostensibly helping are not always grateful or cooperative. Once again, the reader is treated to a second point of view from a new character – Nikys, sister to the famous general Arisaydia of Cedonia – with or against whom Penric must survive his latest incarnation of troublesome adventures. The end is satisfying but screaming for a direct continuation with another appearance from Nikys at the same time.